India is the birthplace of some of the world's biggest religions: Hinduism, Jainism, Sikhism and Buddhism all came into being here. Islam came to India via the Arab traders who had a flourishing trade with the Malabar Coast, and Christianity came fairly soon after its inception to India, brought here by St Thomas, who is said to have landed in 52 AD at the Malabar Coast in Kerala. Each religion flourishes here and India is therefore the place to learn more about this mystic thing called religion. 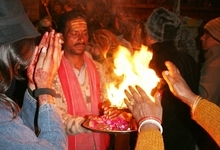 Varanasi, the holy city on the Ganges River, is one of the most important places of pilgrimage for Hindus. According to the Hindu beliefs, to be cremated on the banks of the Ganges, especially at Varanasi, is certain to gain entry to heaven. The principal attraction of Varanasi is the long string of bathing ghats which line the river Ganges from which pilgrims make their sin-cleansing dip and on which bodies are cremated. 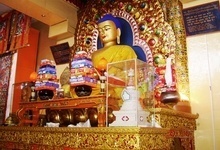 On this tour you visit the major sites associated with the life and teachings of the Buddha. You start at Sarnath, where the Buddha preached his first sermon and then continue to Bodh Gaya where he gained enlightenment. You continue to Rajgir, where he came to meditate during the monsoons; the ancient university site of Nalanda, where he preached; Vaishali, where he gave his last sermon; and Kushinagar, where, lying on a bed under two trees, he died. Combine a visit to the Golden Temple of Amritsar, the spiritual centre of the Sikh religion, with a journey to Dharamsala, the present home of the Dalai Lama, where you can savour the atmosphere of Tibetan Buddhism. The snowy mountains and steep hillsides of Dharamsala have ensured that the region has remained an idyllic place, little touched by the fast changing world around it. North of Delhi is the holy city of Haridwar where pilgrims bathe in this especially sacred spot of the Ganga, almost comparable to Varanasi. Just up-river is Rishikesh, a popular place to come and meditate, do yoga, and learn about other aspects of Hinduism. Tamil Nadu, in south India, is a fascinating state full of ancient Dravidian architecture. Intricately crafted temples, rock carvings, and classical dance are some of the attractions. Starting at the beach side retreat of Mamallapuram, you relax in the historic `French' town of Pondicherry before exploring the main temple cities of Thanjavur and Madurai.